was first mentioned in 1571 as a specialized plant of the forges at Javornik and Jesenice. The technological process practised in the Radovna forges was called »pudlanje«, which is the expression local people used to describe iron smelting with coke. When the forghes operated, the plant consisted of over 10 separate buildings. The structures which we can still see today are remains of workers residences and adjacent forge-structures. At the beginning of the 19th century, the French Emperor Napoleon l. Bonaparte (1769-1821) added a large part of Europe to his empire. In part, also the present-day Slovenia was included in the France’s Illyrian Provinces (1809-1813) which Napoleon had created. According to folk tradition, Napoleon’s army also marched through the Radovna valley. And in this place, a Napoleonic soldier carved in the stone the initials of his Emperor. The inhabitants of Radovna supported the partisan movement , and by the year 1943 the whole village was active in the fight against their German opressors. Radovna was crossing point of numerous trails from Pokljuka to Mežakla, and the starting point of a courier route to Koroška (Carinthia). 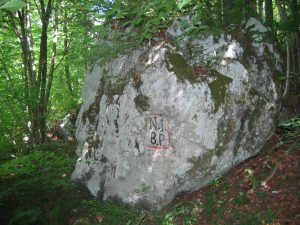 The activists of the Liberation Front, unit Jesenice held meetings in the Radovna valley and it was from Radovna that the supplies were delivered to the partisan technicians in the rock below. On the 20.09.1944 the Germans and their collaborationists retallated by burning the village down. 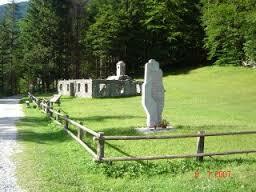 The ruins of the Smolej farmhouse and a monument, uncovered in 1961, still stand here in memory of the tragedy. The mighty Gogala linden tree in Zgornja Radovna grows at an altitude of 725 m. Proud of the farm attraction, the owner recalls how as late as in the first half of the 20th century the branches of the tree were cut for winter feeding of sheep. The trunk has a circumference of 630 cm at chest height, and is more than two metres in diameter. With its mighty crown, the tree reaches 23,8 m high. 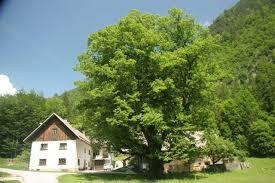 Because of its size and age the tree has been included in the Slovenian Dendrological natural Heritage Inventory. Local people, however, prefer to talk about an age of 800 years, and this fact is also recorded on the topographical map of the area. operated only periodically- in May and June when the snow on the mountain slopes began to melt, and in September and October during the autumnal rains. And even then the same water power was used very economically to turn both wheels. 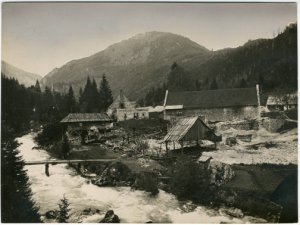 The mill and the sawmill served the Psnak family until the 1970s. In 1997, however, their owner renovated both objects to preserve evidence of the knowledge and work of the local inhabitants, as well as of their remarkable flexibility, which allowed them to make the most of the area’s natural resources and preserve the beauty of nature. Cut deep into the heart of the Julian Alps, the location of the narrow Radovna valley is the primary reason for its harsh climatic conditions. Winters here are indeed long and cold. In the short summer months storms raging in the Julian Alps frequently chill this area too. Right up to the present day, the people of Radovna have had to adjust to such climatic conditions and the valley’s poor natural resources. It is said that the valley was first used by farmers from Gorje area who had their pastures there. Later, six permanently settled farms were established, one of them being the Pocar farm. The name of the farmhouse » Potzer« was first mentioned in a document dating from 1672, while the year 1775, carved into a beam, indicates the time when this farm was built. 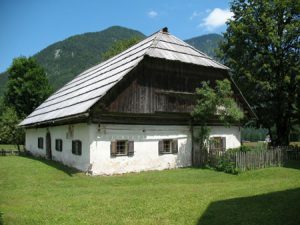 Although throughout the centuries the Pocar farmhouse has seen many generations come and go, it is uninhabited today. But we believe that house, now protected as historical building and turned into a museum, the farmhouse will present a record of the life, work and architectural heritage of the past centuries. Gorje people are most proud of the big bell of Saint George΄s Church in Zgornje Gorje from 1848. It΄s sound can be heard far away. The parish church of Saint George was first mentioned in 1140.Throughout history it was reconstructed and extended; the parish chruch as we know it today was build in 1687.In 1894 the church was renovated in Roman Renaissance style. A year after a painter Matija Koželj from Kamnik brightened up the church with frescoes. On the ceiling over the presbytery he painted God the Father with angels under the God the Father on the left and right he painted sacrifical scenes from the Old Testament and Eucharistic symbols of the New Testament. Beside large statues of Saint Peter and Saint Paul stand on the right side of the main altar the large statue of Saint Francis Xavier, and on the left side the statue of Saint John from God. On the ceiling over the nave , nearly over the presbytery you can find the depiction of the Lord΄s Annunciation to Mary and in on the middle of the ceiling Mary΄s Assumption and coronation. On semicircular medallions over the wall border we find depicted the Joyful Mysteries; the second and fifth mystery in front over the side alters,the rest of the mysteries we find on the choir loft. All these paintings are signs the church was consecrated on Rosary Sunday, which is still celebrated every first Sunday in October. The parish church of Saint George was externally renovated in 1867 and then in 1973 for the 800 years celebration.The interior renovation started in January 1988. The old stone floors were removed and the new ones were put down. The Presbytery was also converted. The new altar facing the people was made from a old communion table.Later the church was repainted and frescoes were cleaned. In 2005 the organ was renovated. In Spodnje Gorje we find filial church devoted to Saint Oswald, an English king who lived in the 7 century AD. The Church of Saint Oswald was first mentioned in 1501. In the past the church was part of the Bled parish and that is the reason why they still have blessing there on Saint Martin΄s Sunday. 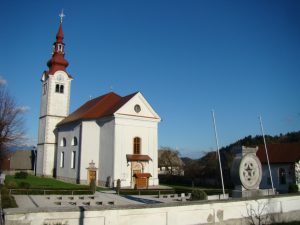 Saint Martin is a patron saint of the Bled parish. It΄s bronze bells were taken during the First World War and later replaced with iron bells. In 2002 the local tradesmen remounted bronze bells. 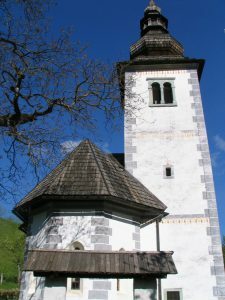 The church of Saint Nicolas – in Mevkuž was first the chapel. Then later they build the church and belfry. The story of the origins of the filial church of Saint Nicolas is something special. Tomaž Bregant the great expert of Gorje tells us legend that a young nobleman got lost while hunting in the woods. He fell into the river. He made a promise that he would build a church if he survived. He did survive and fulfilled his promise and built the church on the very plain that he saved himself on.